Robots taught to dance. It's one of the most intriguing projects now underway at the US Defense Department's Advanced Research Projects Agency, DARPA. The purpose: provide robots with much more agility and maneuverability. DARPA's mission is to develop breakthrough innovation that provides the US military with overwhelming technological advantages. It developed the internet, GPS, cloud computing and has led the way in advancing robotics. 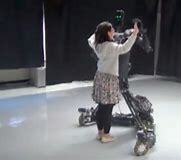 Now, DARPA wants to expand robotic freedom of motion through dance. Specifically to provide robots with more flexibility in military situations. Robot mobility has progressed very slowly. Their motion is pre-programed, mostly linear and lacks fluidity. DARPA researchers are increasing robotic motion through computer algorithms transcoding the lexicon of dance. It's providing the robots with a much higher level of maneuverability, which is very valuable in dangerous military and bomb situations. PackBots are rugged, little robots that patrol, locate and diffuse bombs. They have a mobile base that operates on treads and have a long arm on top. Their motions are jerky and cumbersome. DARPA is giving PackBot a software update with more agile, dance inspired motions. Researchers believe layering in more motions will enable the robots to adapt to changing terrain and conditions. And, importantly they are less dependent on programming done in advance.